You are hereProducts / Bartali Classic Line / Centalto Toscana Rosso I.G.T. PRODUCTION TECHNIQUES: Harvest in the month of September, vinification with 2 daily pumpings over at a controlled temperature of 28°C and one week of maceration. After racking and subsequent malolactic fermentation, the wine is prepared for bottling, which takes place 6 months after harvesting. BOUQUET: Persistent, with a delicate scent of violets and fresh fruit. 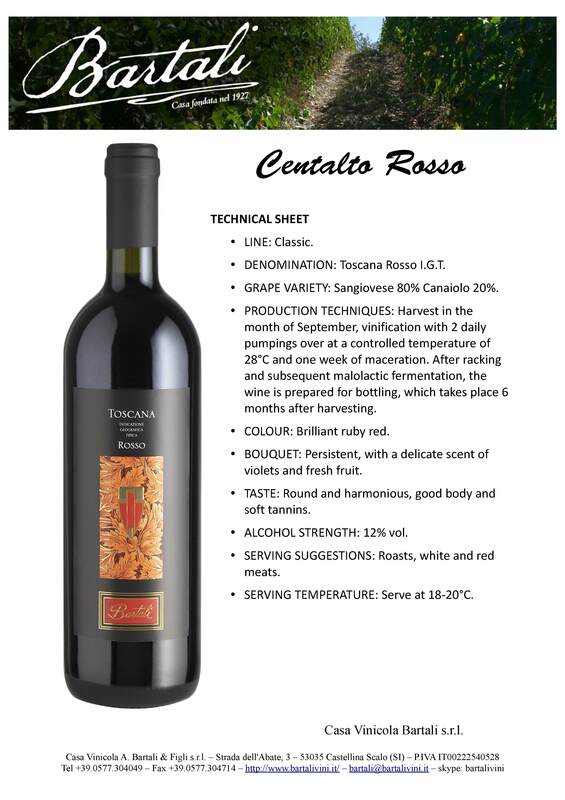 TASTE: Round and harmonious, good body and soft tannins. SERVING SUGGESTIONS: Roasts, white and red meats. SERVING TEMPERATURE: Serve at 18-20°C.